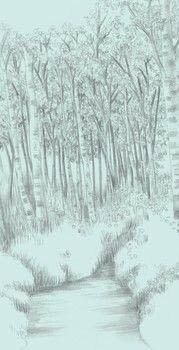 This is another view of trees but in a more dense forest than in the previous project. 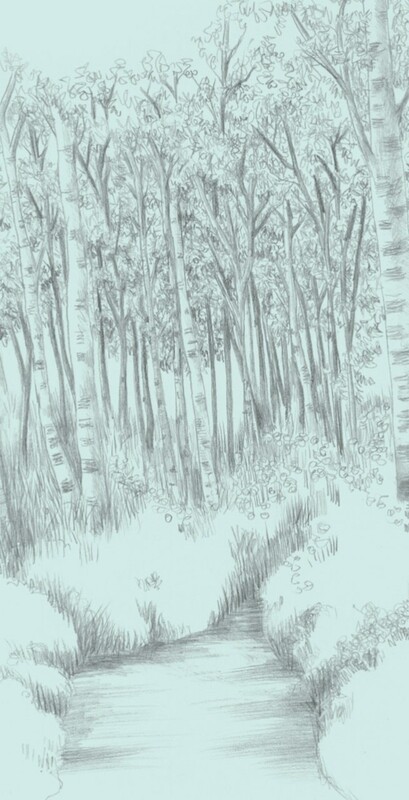 The birch trees here are slender, with contrasting marks on their trunks. Posted by Arcturus Publishing • Published 5th April 2019 • See Arcturus Publishing's 9 projects » © 2019 Susie Hodge / Arcturus Publishing · Reproduced with permission. 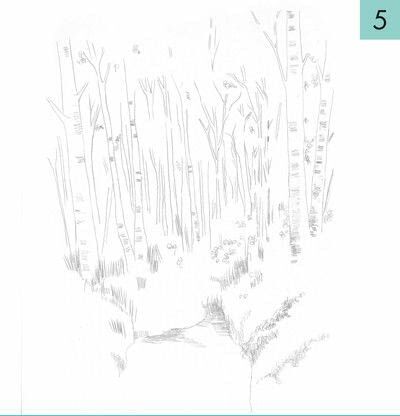 keep the composition centred on the paper, also lightly mark on the area that leads into the grass – such an ‘arrow’ will point to the main part of the drawing and subconsciously attract viewers’ eyes. Firm up the ‘arrow’ of land at the front, then start to draw in some more definite tree trunks. The outer trunks are wider than the central ones, because of perspective; they are closer to viewers than the trees in the centre. 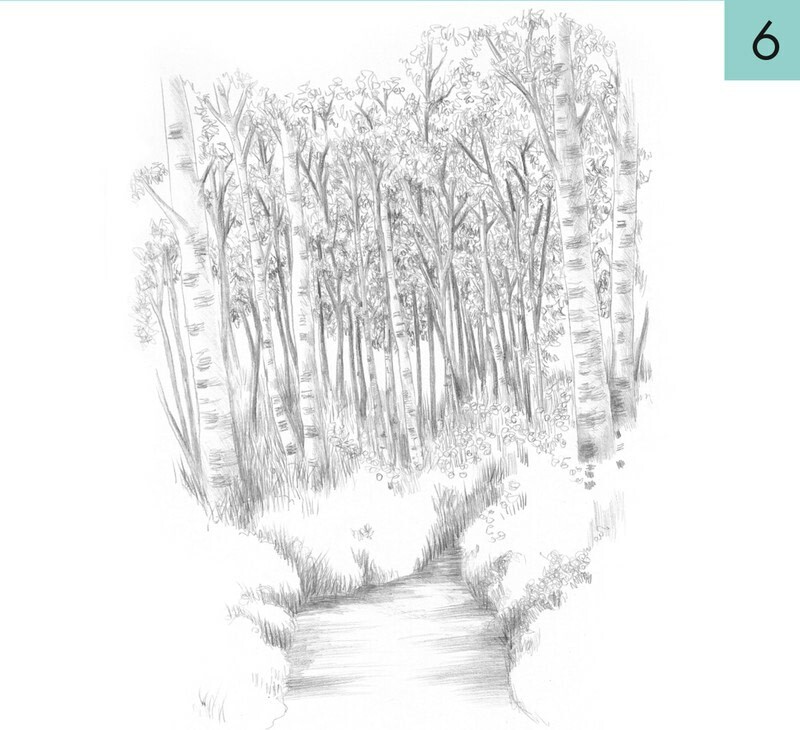 Continue drawing the trees. Although tall and thin, none is uniform or symmetrical; all have branches that spread at the top, and each trunk appears to become narrower as it recedes into the distance. You can also introduce some soft, short tufts of grass. Using the 2B pencil, begin drawing marks on the tree trunks. 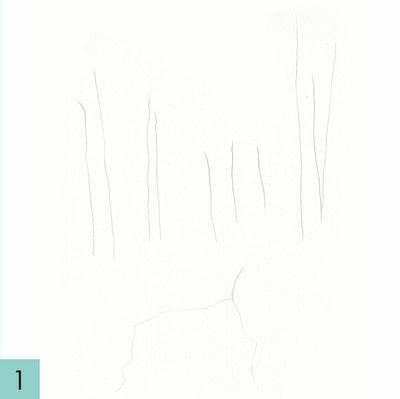 As with the trunks and branches themselves, such marks should be haphazard and asymmetrical because they are organic. Notice too that the trees themselves occupy more than half of the composition. Make sure that your trees overlap in places to show linear perspective, while some parts in the distance will be lighter and less detailed to show aerial perspective. Build up more marks on the trunks, some grass and some cast shadows, always using a light touch. 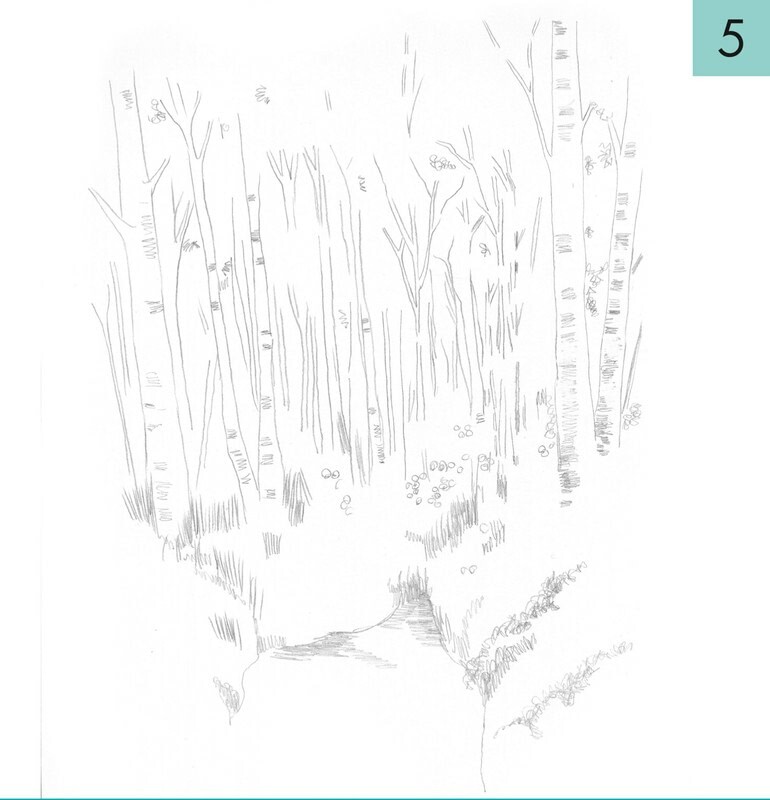 Squint your eyes to see where the light is coming from and apply shadows consistently across the scene. 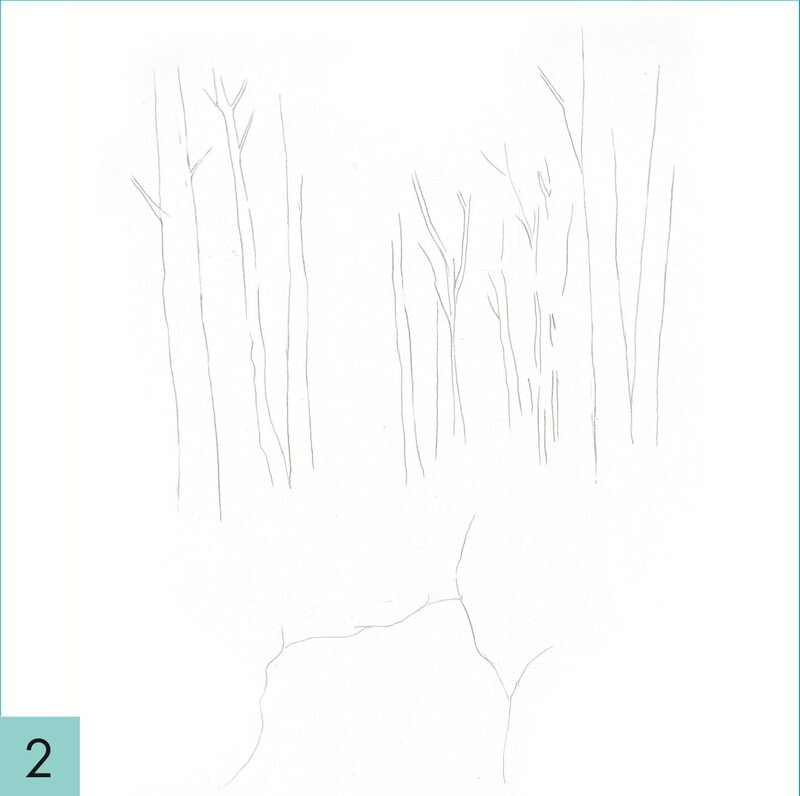 Use the 5B pencil and make sure some trunks and leaves are much darker than the lightest areas. 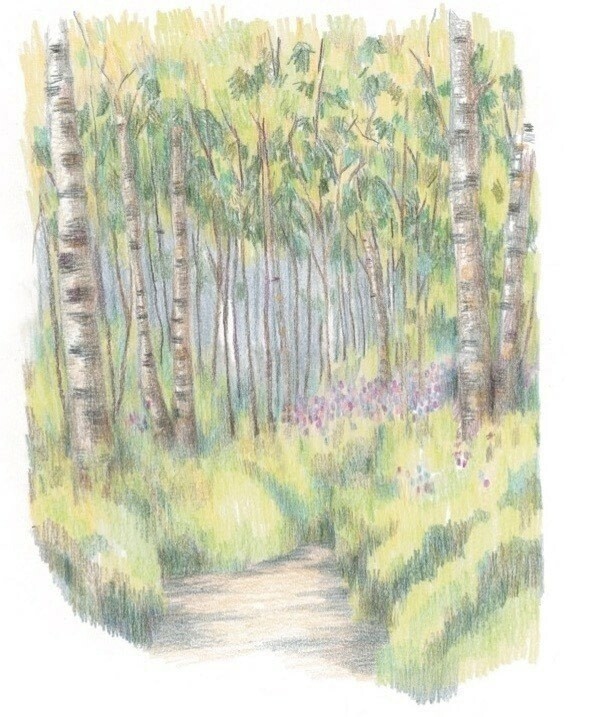 The grass in the foreground is more apparent and carefully drawn than the overall sense of flowers closer to the tree trunks. The narrower trunks appear much darker than the broader ones, as they are in shadow – behind the lighter trunks and under the canopy of leaves. a picture. 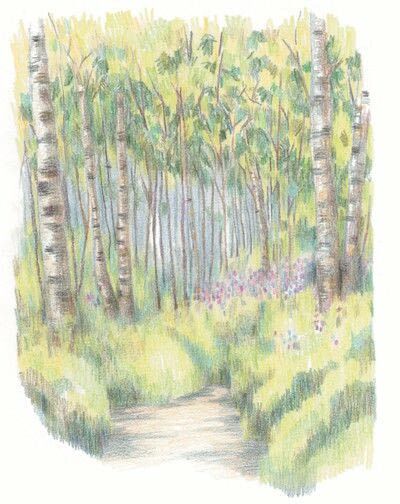 Because coloured pencils can sometimes be a bit too vivid and unnatural for a landscape, I also added some layers of light grey in places. Be patient; this kind of coloured pencil drawing takes time.